There is no doubt where we are going today. The only thing to decide is how we are going to get there. We could walk but that would be longer than any walk we have so far undertaken on this tour so the sensible option is to take the car and park somewhere on route. 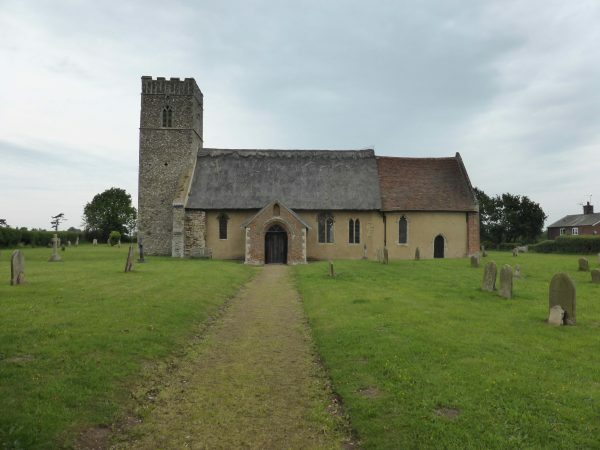 Our chosen spot is alongside the church at Butley, from here we follow a track that soon leads us onto another stretch of the Sandlings Way, which is also the coastal path. We turn right and follow the waymarks, joining a lane that takes us to Coulton Farm and then turning right to pass Bush Covert and walk over Barrow Hill. Lyn comments that this is my kind of coastal path, we are about a mile in land so no danger of steep cliffs, given the local terrain there is definitely no danger of cliffs. Through the gate we turn left towards the Butley River. Now we are in for a new experience, we have reached the Butley Ferry. The Butley Ferry is about as different as it is possible to be from the Sandbanks Ferry, the last ferry we were on. This one is a rowing boat, with a maximum allowance of four passengers. 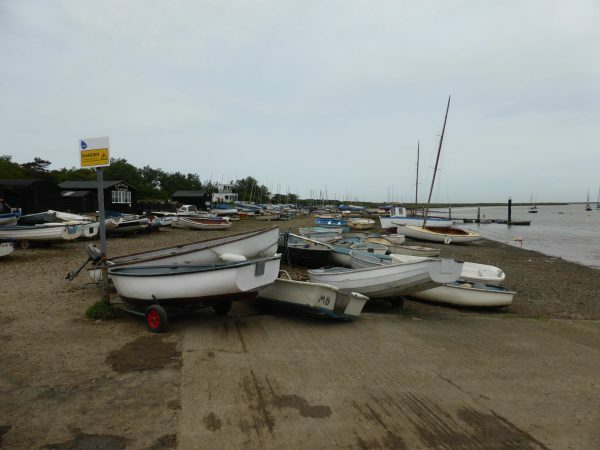 The Butley Ferry is thought to have started in the 16th Century, making it one of the oldest ferry crossings in the country. The information board tells us that the then landowner Robert Forth employed a ferryman who lived next door to the river. It goes on to say that a lady who holidayed at Ferry Farm in 1914 recalls that “the ferry rarely functioned – the ferryman was constantly in and out of jail”. The ferry stopped operating in 1932 but has recently been revived. Our ferryman today is Nick. He loads us into the boat, Dexter and Crosby jump aboard without hesitation. We cast off onto the river. There is a strong breeze and the tide is against us. Nick tells us it is “hard work battling against the elephants, or should I say the elements”. He is one of fifteen ferrymen (including one lady) who volunteer to each operate the ferry for three days a year. The fees collected are used for the upkeep of the ferry with the surplus going towards the annual ferryman’s supper (I am sure that is a quiet affair). Nick is interested in our travel plans and we tell him about our blog. Having reached the far side we bid Nick farewell and continue along the path leading to Ferry Cottage. On the path we pass a lady and young lad who are Nick’s wife and son and he has already spoken to them about our travels. Alongside Ferry Cottage is Pinney’s Smokehouse. Our route takes us along the track joining a lane that passes Gedgrave Hall. 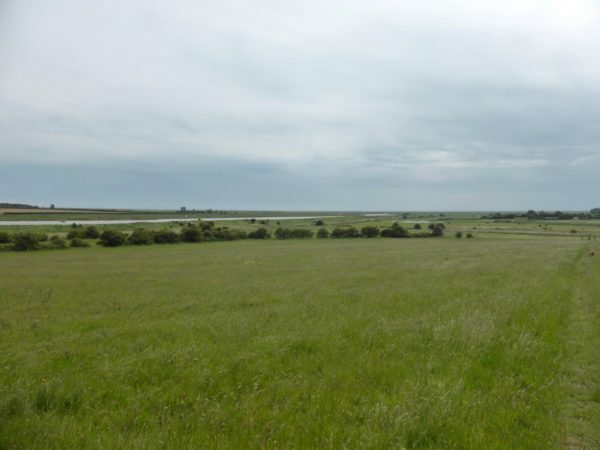 Shortly after, with Orford Castle on the horizon, we turn right to take the footpath towards the River Ore. 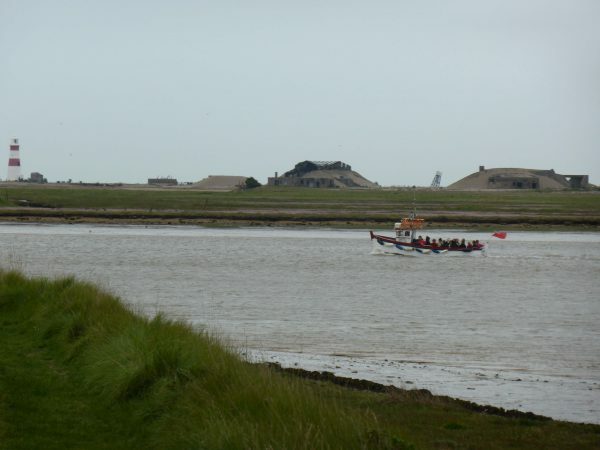 It is a straightforward route from here following the estuary into Orford. 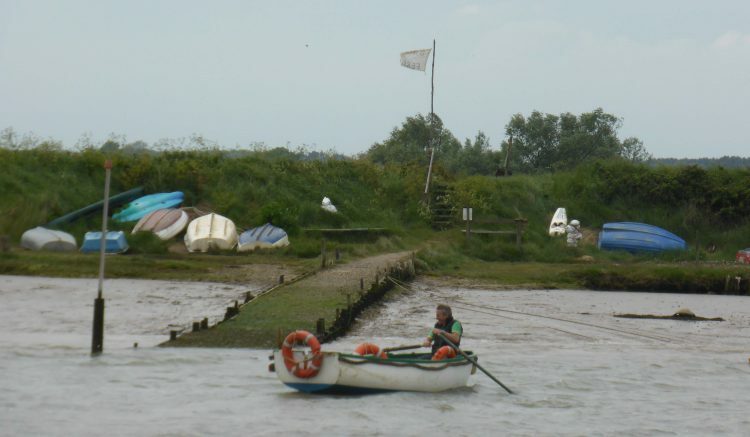 On the opposite bank is Orford Ness, this is a continuation of the isthmus that we were on a few days ago at Slaughden. The lighthouse of Orford Ness and the “pagodas” built by the Atomic Weapons Research Establishment are clearly visible. Being a bank holiday weekend Orford harbour is busy. There are families crabbing and throngs of people milling around. We sit in the shelter out of the strong breeze for our picnic. A young girl and her mother join us, the girl is fascinated by the dogs. Especially the “ginger dog”, I quickly explain that he is Fox Red not ginger. Passing through the busy streets we head towards the church. A lady (a loose term) is “exercising” her dog in the flowerbed by the front door of one of the cottages leading up to the church. She watches and then walks on, I observe and offer her a poop bag. She says it was just a false alarm. Well it was a pretty steamy false alarm! Such antisocial behavior from dog owners makes me wild. We take a slight detour to the Castle, built in 1165 by Henry II it has a well preserved keep. 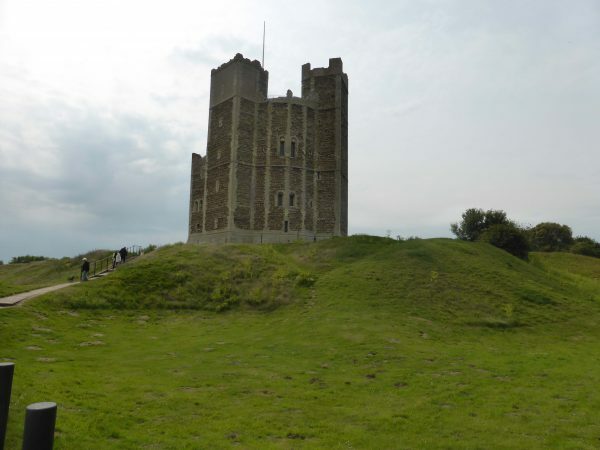 Orford Castle is also associated with the legend of the Wild Man of Orford. It is said that a local fisherman caught a naked, hairy man in his nets. He was kept captive at Orford Castle for six months where he behaved in a feral fashion until his escape. Later accounts of the event describe the captive as a merman and there are about twenty baptismal fonts in Suffolk and Norfolk with carvings of the merman. A good job I had calmed down from the dog poo incident, I would not want to be held as a wild man in the Castle. Although spending six months in the Unicorn might turn me a bit feral. Continuing our walk we head along the road out of town until we reach the school and fire station, here we take the footpath towards Sudbourne Hall. Passing the hall we continue along an impressive avenue of sweet chestnut trees before turning to go through woodland and across open fields to reach Chillesford and turn left to the village. Chillesford Church and a number of other local buildings are built of the local red crag bricks. At the old brickyard a 20metre skeleton of a whale was once found. 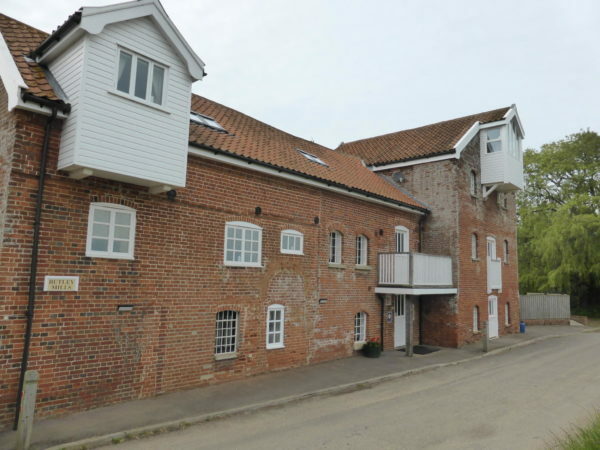 A short walk along the road and another left takes us to Butley Mills, this fine old building has now been sympathetically converted into residential dwellings. It is good to see old industrial buildings being used rather than standing derelict. Our route takes us onto the lane to once again follow the Coastal Path, returning us to the junction with the footpath back to Butley Church and our car. The part thatched Church of St John the Baptist was built in the 12th Century. The door is locked so we are unable to venture inside. Todays walk has been just over 10.5 miles. A most enjoyable day with the ferry crossing the main highlight. Thanks again Nick!